One-third of the world’s population (2.4 billion) will remain without access to improved sanitation in 2015, according to a joint WHO/UNICEF report issued Wednesday. 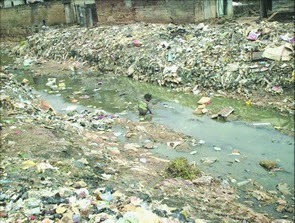 The report, entitled: Progress on Sanitation and Drinking-Water 2013 Update, warned that, at the current rate of progress, the 2015 Millennium Development Goal (MDG) target of halving the proportion of the 1990 population without sanitation will be missed by eight per cent or half a billion people. While United Nations Children’s Fund (UNICEF) and WHO announced last year that the MDG drinking water target had been met and surpassed by 2010, the challenge to improve sanitation and reach those in need has led to a consolidated call for action to accelerate progress. “There is an urgent need to ensure all the necessary pieces are in place – political commitment, funding, leadership – so the world can accelerate progress and reach the Millennium Development Goal sanitation target,” said Dr Maria Neira, the World Health Organisation (WHO) Director for Public Health and Environment. “The world can turn around and transform the lives of millions that still do not have access to basic sanitation. The rewards would be immense for health, ending poverty at its source, and well-being,” Neira said. In view of the report, the United Nations Deputy Secretary-General Jan Eliasson, urgently called on the world community to combine efforts and end open defecation by 2025. With less than three years to go to reach the MDG deadline, WHO and UNICEF call for a final push to meet the sanitation target. “This is an emergency no less horrifying than a massive earthquake or tsunami,” said Sanjay Wijesekera, global head of UNICEF’s water, sanitation and hygiene (WASH) programme. “Every day hundreds of children are dying; every day thousands of parents mourn their sons and daughters. We can and must act in the face of this colossal daily human tragedy,” Wijesekera said. Among the key findings from the latest 2011 data, the report highlights: Almost two-thirds (64 per cent) of the world’s population had access to improved sanitation facilities, an increase of almost 1.9 billion people since 1990. Approximately 2.5 billion people lacked access to an improved sanitation facility. Of these, 761 million use public or shared sanitation facilities and 693 million use facilities that do not meet minimum standards of hygiene. In 2011, one billion people still defecated in the open. 90 per cent of those who defecate in the open are the in rural areas. This story was published in Daily Newswatch on May 16, 2013.